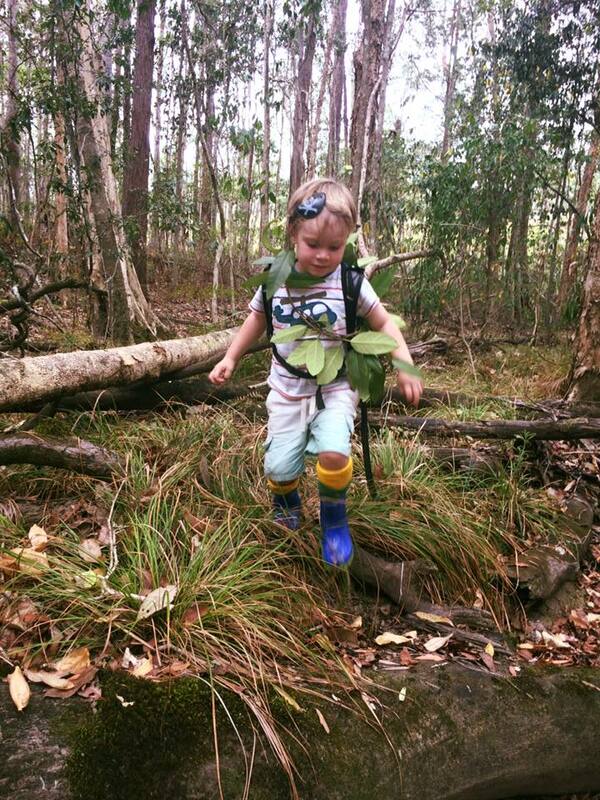 Natureweavers is the longest running and award-winning forest school on the Sunshine Coast. Led by Carly Garner, a pioneer in Australian nature pedagogy and environmental education. WildKids is our weekly ‘earth school’ program for children aged 2-12 years. WildKids spend their whole day outside, exploring our specially selected wildspace in Black Mountain – a perfect balance of grassy backyard, diverse forest, peaceful waterholes and abundant wildlife. WildKids will come to know this local land deeply, developing connections, experiential understanding and bushcraft skills as well as experiencing the simple freedom of unstructured, extended periods of time playing in nature. A gentle rhythm guides our day, but the specifics are child-led, interest-based, experiential and seasonal. Children are mentored into nature with knowledge, with respect and with love – of children and of earth. We welcome all children aged 3-16 years to come and experience our Earth School during the holidays. Children will play and learn in wildspace, in tune with the natural rhythm of the season, learning skills to help them make friends with nature. An epic game of Capture the Flag in the Natureweavers Forest! Learn the wilderness skills of natural navigation, camouflage and silent hunting, build a ‘team base’ in the forest, then capture the other team’s flag from their base. Learn how to whittle a knife and fork from foraged wood and then play The Chocolate Game – roll the dice, get a 6, eat one piece of chocolate at a time with your knife and fork. How may pieces can you eat before the next person rolls a six? Old school fun with a Natureweavers twist! We’ll explore the Natureweavers ecosystem in detail and discover what creatures and plants we share our land with. Equipped with looking glasses, binoculars, cameras, paper and pencils, children will learn about ecosystems in balance (and out of balance!) and how we can care for the earth, starting in our own garden! Children will make a take-home ‘wicking bed’, and scatter seeds within it to attract beneficial insects to their own garden. As well as a healthy ecosystem, herbs can contribute to a healthy US! 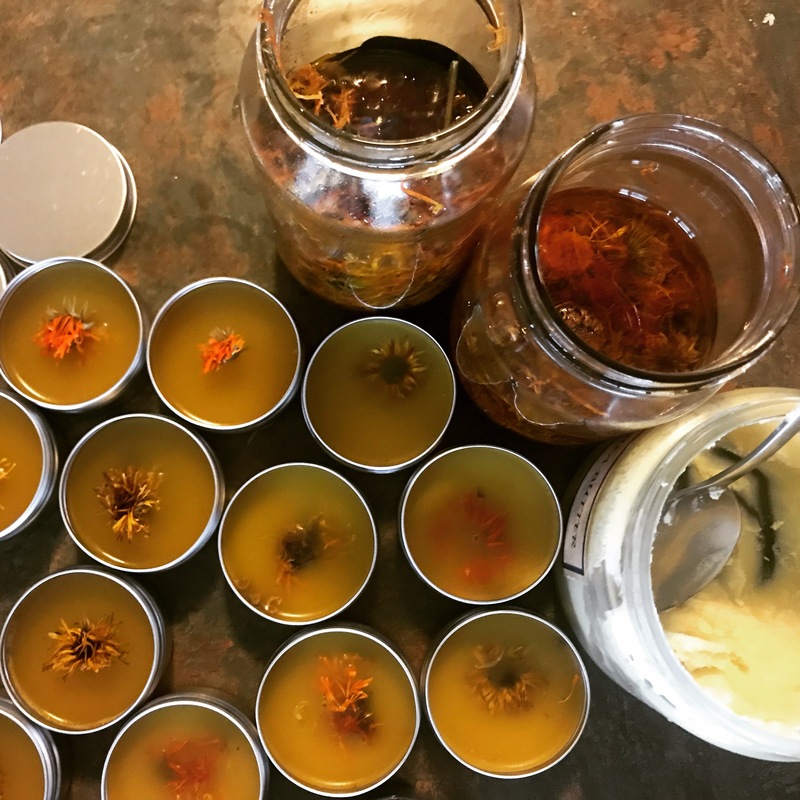 Let’s explore which herbs to use for self care and how to use them – including a geranium foot bath, lemon balm tea, calendula balm and a tulsi smudge stick. Children will also receive cuttings, seeds and knowledge to begin their own ‘herbal healing’ garden at home. We will whittle a magic wand from elder harvested from the Natureweavers land. Elder makes for powerful wands, and is particularly protective of children. We’ll then handsew and decorate a case/pouch/sleeve for our wands from natural fibres including felt, silk and cotton. A truly magical morning! We will sew a Dream Pillow from natural fibres including felt, silk and cotton, and fill it with dried herbs – including mugwort and lavender – to support a peaceful sleep and wonderful dreams. We’ll also make Dream Catchers from vines foraged from the forest, and decorate them with crystals, feathers and other treasures! Can’t wait to get to sleep after this session! Make your own simple weaving loom from recycled materials, and then weave a wall hanging/mat/pouch/scarf with upcycled fabrics including t-shirts and bed sheets. Wet felt an autumn-inspired playmat, then handsew a little autumn wooden gnome to play upon it. Making their own toys is so empowering for children (and adults!) – there are years of play in these open-ended toys. This session was created by Carly Garner and Fiona Ball in 2014 to nurture the connection of women to self and to earth through the creation of our own personal talisman. 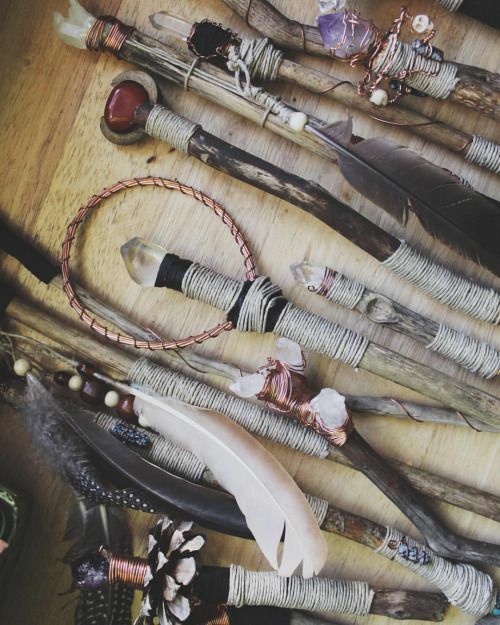 Through elemental ritual and conscious handwork, we will seek our stick from our local wildspace, work it in traditional ways, and adorn it to represent who we are in this moment in time. This session includes deep ecology practice, walking meditation, traditional bushcraft skills, sacred art and creativity, shared feasting and conscious sisterhood. Gather in circle and discover the the peace and power of weaving with nature. 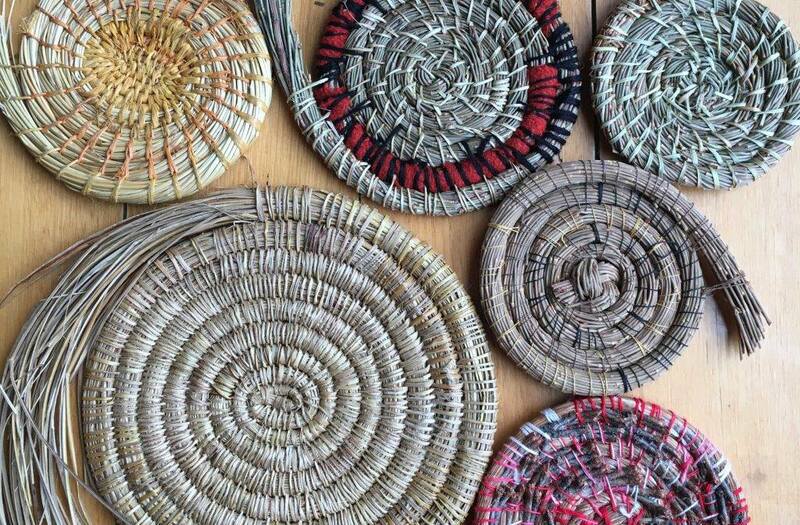 In this session we shall identify and harvest natural materials for fibre and weaving from our land (both plant and otherwise), learn how to prepare them for handwork, and then create functional and beautiful vessels, baskets, pouches and talismans. Our session will start with a Sit Spot practice, and will also include how to make string/rope/cordage, how to coil a basket, and how to sew Bangalow Palm leather into vessels/bags/bowls/pockets. This workshop will empower you to forage and weave your way around your own backyard and beyond!